Notes: Developed by Jack Schlotter of Medford,Oregon. The pattern utilizes a foam body that is segmented, as well as Deer or Elk Hair. 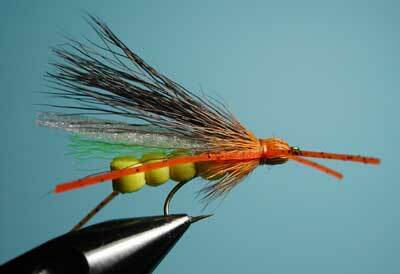 The foam and hair give the fly very good floatibility, particularly in rough water, with a large hook size. The Golden Stone pattern can also be used for hoppers. The Giant pattern is for Salmonflies, Pteronarcys californica. Salmonflies can reach 3-4 inches, so a size #4 is appropriate. 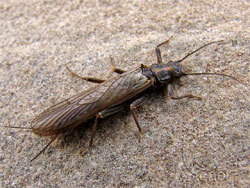 Stoneflies are found in freestone streams and rivers. The Salmonfly nymphs crawl out of the water in Spring and hatch on the rocks and brush along the shore. The hatch will start on the lower reaches of the stream and move upstream as the weather warms. The adult Salmonflys will flutter and fall into the water during mating. This will last a few days to a couple of weeks. Presentation of this fly is best along the banks with a drag-free drift as most of the fallen adults are usually within 2-10 feet of shore . Prior to the hatch, nymphs are best. The Giant Rogue Foam Stone is best a day or two after the major hatch occurs. After the hatch, try a nymph dropper under the Giant Roque Foam Stone as the trout will still be keying upon the Foam Stones despite the absence of the adults at that time. 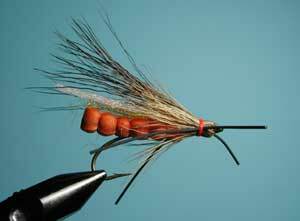 Rather than a stonefly nymph as the dropper, try a smaller nymph such as a #14-16 Pheasant Tail, Prince, or BH Hare's Ear since they are easier to cast and will not sink your dry. The North Yuba and the Truckee have hatches that are usually around Memorial Day and into June as well as many other west slope Sierran streams. Look for runs, eddies, and pools. Try fishing upstream with casts first to the bank and subsequent casts 2-3 feet further from the previous one. Sidearm casts will often be necessary to keep the fly out of the brush. Most casts will not need to be more than 30 feet. Since these flies are large and air-resistant, use a rod large enough to handle the wind and allow you to present the fly where you want it. A 7.5 foot 4X leader with 1-2 feet of 4X tippet will usually turn over the flies well.